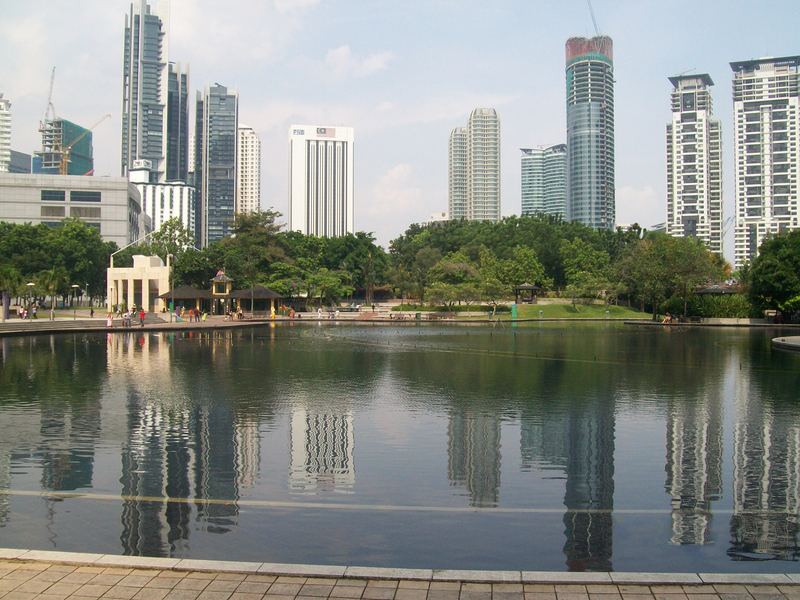 Taman Tasik Titiwangsa also known as Titiwangsa Park or Lake Titiwangsa is one of the most popular recreational parks in the northern part of Kuala Lumpur. Its main attraction is the large lake where one could take a marvelous photo of Petronas Twin Towers, KL Tower and Istana Budaya (arts and culture gallery) reflecting to the calm and serene water. Two days’ sojourn in Malaysia is not enough to explore the beautiful places in this country. But then I was thankful I was able to see Malaysia’s fascinating and famous tourist attraction, the Petronas Twin Towers. My hubby had frequented the country because of his company’s IT seminars usually held in Kuala Lumpur. As he attended another seminar this September, he enjoined me to spend a week-end getaway in Malaysia, to which I was so grateful to him. 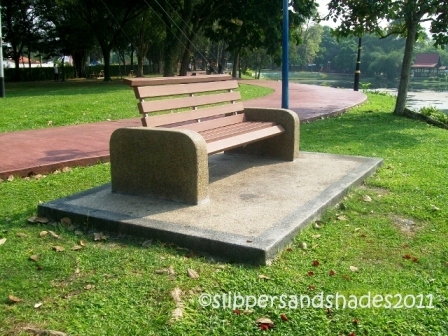 We only had limited time in our last day in the country, so we just hang around to Titiwangsa Park, the nearest park in KL Central to where we stayed for the night. We asked the receptionist of the hotel how to get there. He gave us the instruction, though not clear, off we went with our adventure. 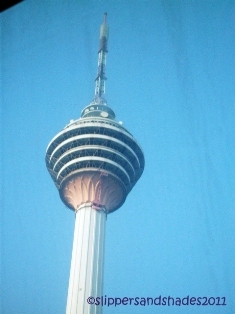 From KL Sentral, we rode in KL Monorail going to Titiwangsa, the last station (2.50 RM/head). We asked the cashier how to go to the park. Learning it was near to the station, we didn’t bother ride a taxi. We just walked and asked people in getting there. Walking is a good body work-out. I was glad that we were able to sweat out that morning. Malaysians were good people, though some can’t speak straight in English they could tell us the direction. We passed by a small tunnel and kept walking until we reached the main highway. Knowing we were lost, we went back to the monorail station and took a taxi ride. 10RM was quite high so we use our haggling skills (the Pinoy way) to reduce it to 6RM. The driver nodded his head and he drove off. On our way, we discovered that the park was very near to where we lost the trail! Hahaha! Never mind that funny experience. 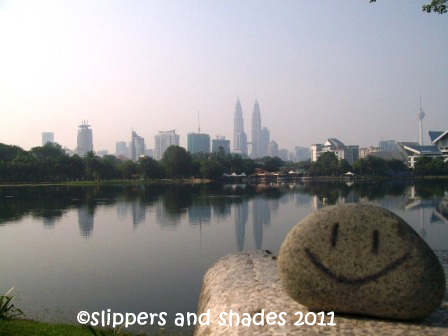 Titiwangsa Park relieved our foot aches as we saw its peaceful charm. What amazed me so much was the reflection of buildings and trees to the lake. The concrete walkway was filled with people who jogs, walks and some were just lazing around. The area where we stood was so clean and calm. Indeed, this park is an ideal week-end get away for the family. My playful hubby took out a smiley stone from his pocket, put it in a rock and looked for a beautiful angle where the three prominent buildings served as the backdrop. What a good smiley shot he did. hahaha! There were also restaurants and children’s playground near the lake. We didn’t stay long for we will buy some important items before we go back to Manila this afternoon. We boarded a taxi going back to monorail station. Surprisingly, we paid 3.60 RM only. 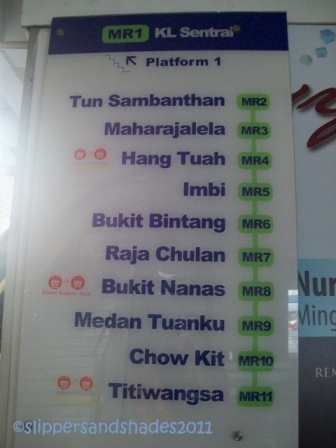 Then we rode at monorail station again (2.50 RM) and alighted at Bukit Bintang Station. We explored Sungei Wang Plaza in search of the branded bag Long Champ, which my hubby’s boss urged him to buy. But there was no sort of that bag in that mall. It was almost twelve noon and I could hear the growling sound in my stomach. We proceeded to the 4th floor to eat our lunch at Restoran Sin Tai Kar Lok, Manila’s version of Food Court. We were given a plate of rice then we chose our preferred viands among the Malaysian cuisines lined up in front of the restaurant. We bought ice tea for our refreshments. 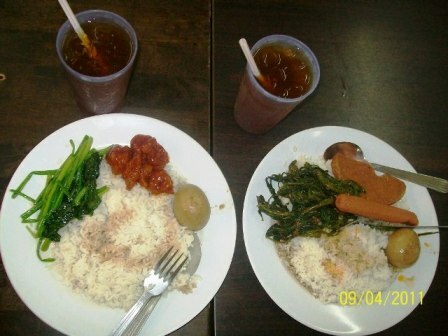 My hubby told me that this is the usual style of restaurant here in Malaysia. Our meal costs 32.70 RM. Not bad. We took a monorail ride in going back to our hotel in KL Sentral. Our flight going back to Manila is 5:35 pm. From KL Sentral we rode in the KLIA transit, the express train going to KL Airport. Fare-35 RM/head. As we were on our way, we enjoyed watching the green scenery and beautiful buildings. 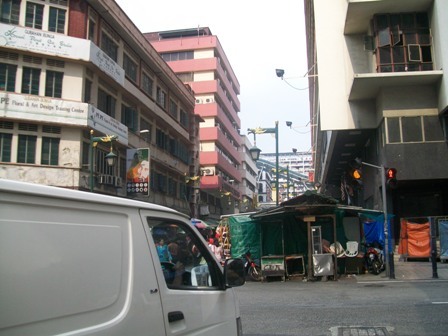 I stayed awake in this trip because I want to savor my last glimpse of Malaysia. As I’ve said, two days are not enough to explore this country, but nonetheless, it’s all worth it. Not only that I saw the twin towers, I was able to see and mingled with the people (Indians, Muslims and Chinese) and the culture of this country. And I say, Malaysia, Truly Asia is a beautiful country to visit. Way back home Manila with another one good memory to cherish. 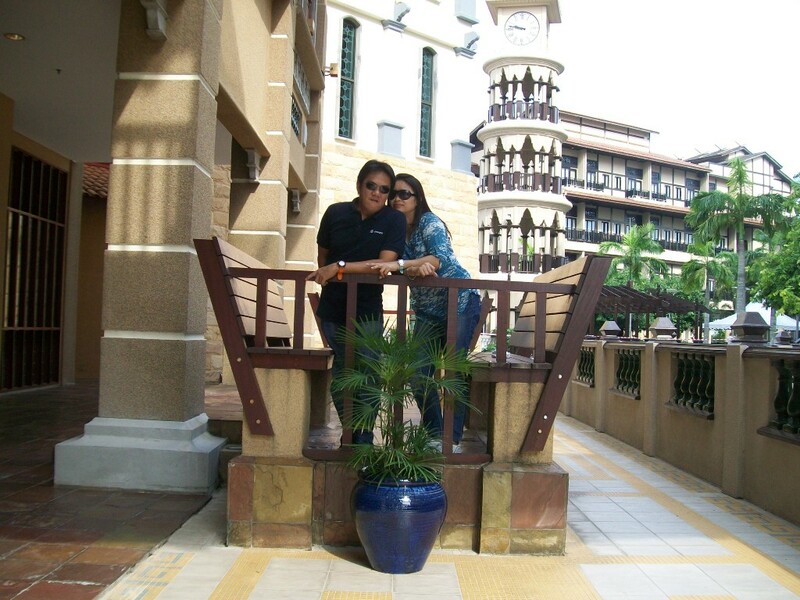 My husband enjoined me go to Malaysia after his third IT seminar in Kuala Lumpur. I booked my flight at Cebu Pacific through on-line facility (8:55 pm flight) going there. My return flight was booked in Malaysian Airlines with him. I paid P1,600 for the travel tax to which was not included in an online booking and P750 for the boarding pass. It was 12:30 am when I arrived at Kuala Lumpur domestic airport. I told my hubby not to fetch me at the airport so we can save money. He instructed me to ride in an airport taxi for it was the safest way in going to Pullman Putrajaya Lakeside Hotel (situated in Putrajaya) to where he stayed for the week. The regular rate going to the hotel was 64 ringgit. But since it was past midnight, 50% of the regular rate was added so I paid 96.30 ringgit all in all. 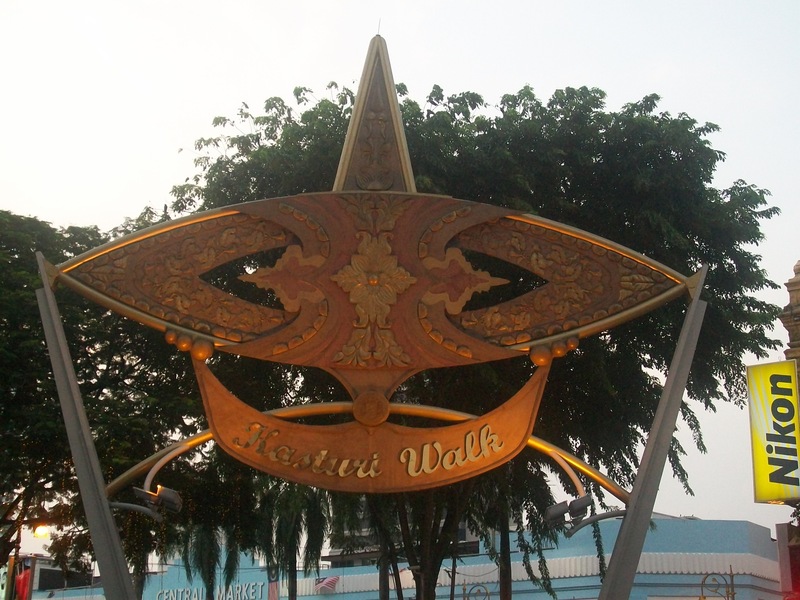 It was my first time in Malaysia and it was in wee hours so I can’t help not to get scared. To fight this fear, I livened up the ride with a lively conversation with the driver. But I observed, he was a man to thrust so eventually, I felt comfortable with him. I was in awe as we enter the main entrance of what has been considered Malaysia’s first premier icon hotel. 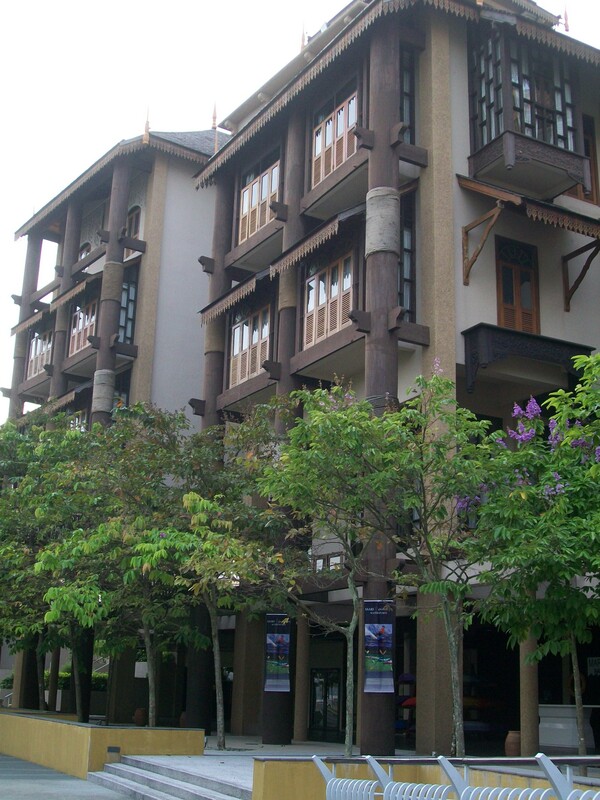 The Malay ethnic architectural design was brilliantly lighted. Thank God, I arrived safe and unharmed. The driver thanked me as I hopped out from the car. I smiled and thanked him too. 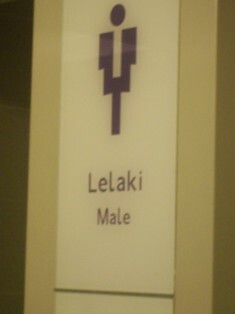 I want to surprise my hubby so I didn’t call him to fetch me at the lobby. The officer in charge graciously accompanied me to our room. As expected my hubby was surprised when he opened the door. I was so delighted to see the elegant room which was big enough for two. And I was so thrilled seeing an open veranda. But I was so sleepy and tired from a whole day work so after few minutes of conversation with my husband, I retired into sleep. It was seven in the morning when we woke up. I leaped out of bed and open the glass door to smell and feel the morning breeze of Malaysia. I was expecting that it was as cold as Baguio for the hotel was beside the lake, but it’s not. 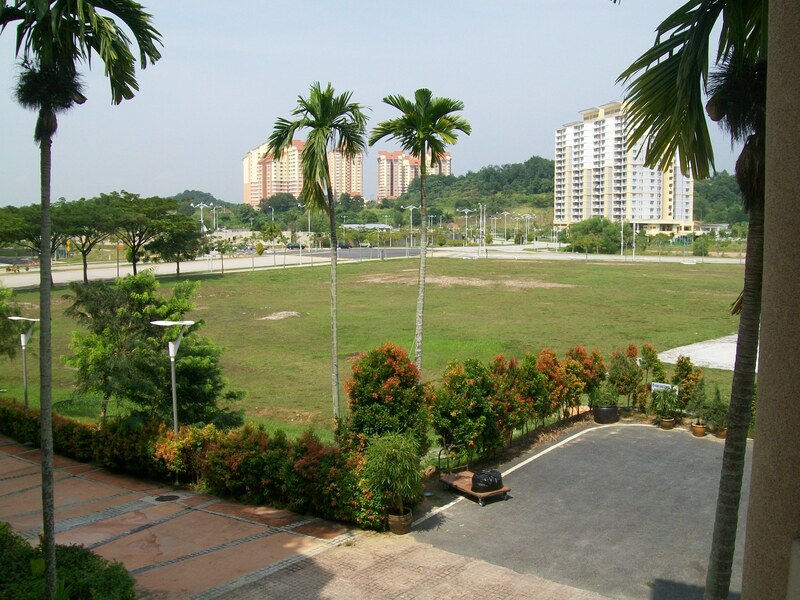 From the veranda I saw a nice view of a huge lot which looked like a park. With our cam, we rushed ourselves for a morning walk in the lake side. 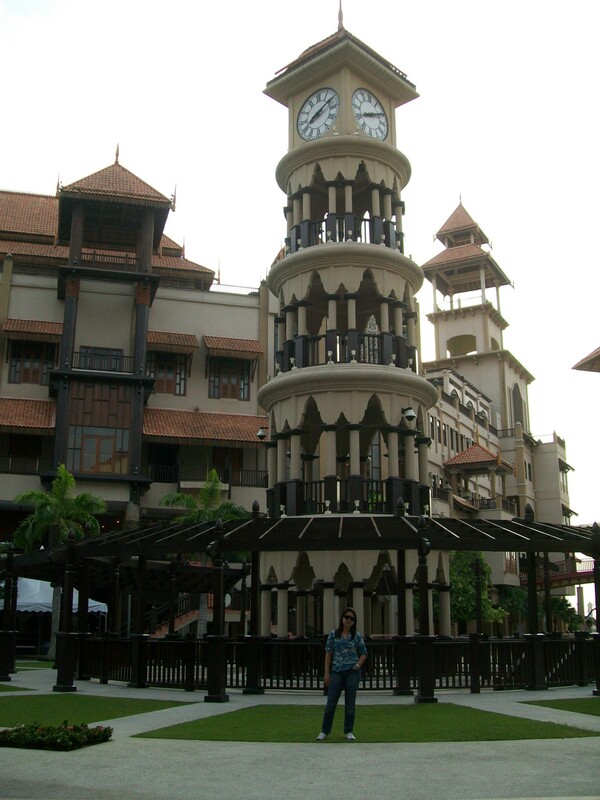 We passed by a towering big clock and saw stunning units in Malay, Chinese and Indian architectural designs.There were jet skis and other water sports equipment for an exciting activity. Most of the staff on the lake side were Bombay. I was expecting that they will greet us, like the Pinoy style of entertaining guests, but some just smiled and some just looked at us. We continue walking until we reached the bar area where no one is hanging around. We had the place all by ourselves. 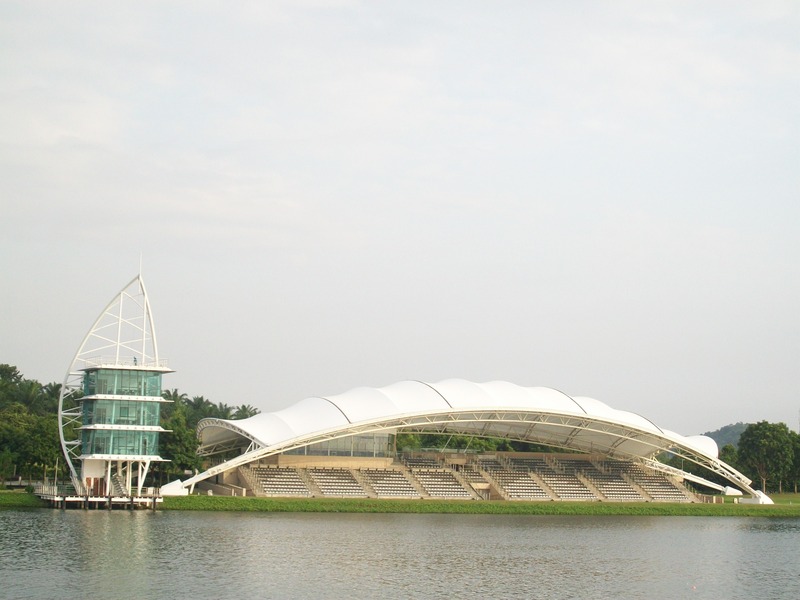 There we saw an amphitheater and the Putrajaya Convention Center. At 9 am, we headed to B’s, a chic All Day Dining outlet for our free delectable breakfast. It serves authentic Asian and Western food in a buffet and ‘a la carte” style. We met Bens, a fellow Pinay who was in a one-month stay in the hotel. We only had short conversation as she was sitting far from our table. Our stomachs were really heavy when we left B’s. We checked out from the hotel at 11:30 am. We were thankful to Bens for reserving us two seats in the hotel’s shuttle van going to Putrajaya Sentral. It was a train terminal going to Kuala Lumpur. Bens was in a visit to KL that day. From Putrajaya Sentral station we paid 9.50 ringgit for our train fare going to KL Central. Bens parted when we reached this station. Since it was hot (as hot in the Philippines) and our bags were heavy, we took Budget Hotel which was so near the monorail and Java Line. The rate was affordable for one night stay. 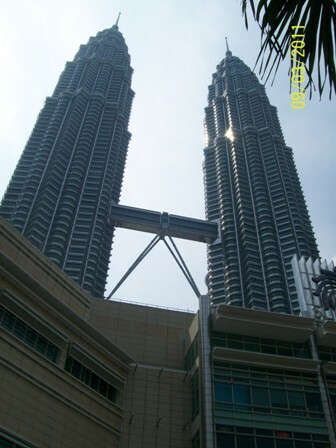 We rested for two hours as we prepared our itchy foot to visit our main destination, the Petronas Twin Towers. 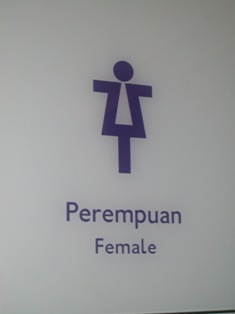 Funny, my husband can’t catch a perfect timing to visit this famous tourist attraction in his recent stay in Malaysia. 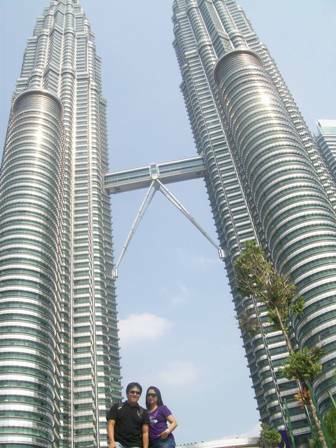 This time, he was really insistent to catch a glimpse of the reigning tallest twin towers in the world. And he wanted to go there with me.